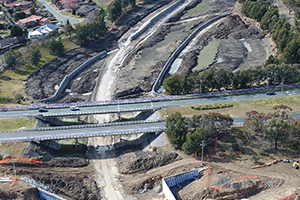 25/03/2019 - Remediation civil works complete, remediation planting continuing. 06/02/2019 - Remediation work to repair damage caused by frequent summer storms is under way and will continue for a few weeks, weather permitting. This project is one of seven ACT Healthy Waterways sites across the ACT where works are taking place in an active water course and, as such, it is very susceptible to damage and delays during construction. Soil, plants and infrastructure can be washed away before they are established. While the weather is fine, crews are working to repair damage and establish infrastructure that will slow the water down and protect plants and soil before the next storm event. 14/12/2018 - Works are underway to repair damage caused by recent storms. 02/11/2018 - The final concrete pour has occurred at the weir and site sheds will soon be removed. 6/11/2018 - Site fences are likely to be removed during December but fencing around the new wetlands will remain in place for approximately six months to allow the plants to establish. 22/06/2018 - Construction on the new wetlands is now complete. 11/07/2018 - Work continues on widening the weir. Isabella Pond will remain empty until those works are complete. Construction on the first ACT Healthy Waterways project – two new wetlands at Isabella Pond - was brought forward to coincide with the upgrade of Isabella weir and to limit the impact of construction activity on residents. When complete, the wetlands will attract birds and other native wildlife and provide more opportunities for recreation. They will also play an important role in improving water quality downstream in Lake Tuggeranong, the Murrumbidgee River and the wider Murray-Darling Basin. Construction of the wetlands is due to be completed early 2018. However, the wetlands will not reopen to the public until work on the weir is complete, Isabella Pond has been refilled and the new plants have had time to establish. Access to parts of the pond and wetlands may be restricted for up to two years. Isabella Pond and the adjacent Upper Stranger Pond were drained in March 2017 to allow for the works to commence. This ‘dewatering’ offered a unique opportunity to remove carp, an introduced freshwater fish listed as a pest species. Almost four tonnes of carp were removed (1.2 tonnes from Isabella Pond and 2.6 from Upper Stranger Pond) and turned into compost and liquid fertiliser. Upper Stranger Pond has since refilled with water and a native fish restocking program has commenced. Isabella Pond will be allowed to refill naturally once the current construction works are complete. +Construction may be subject to delays for a number of reasons, including bad weather, especially as construction is occurring in a ‘live’ and active waterway. *Isabella Pond will naturally refill with water. How long this takes will depend on rainfall in the catchment around this period. The pond will not reopen until it is full. Trucks will pass in and out of the area during the improvement work. Routes have been established to minimise traffic disruption and noise. Detours for walkers and cyclists are in place and are clearly signposted. Both ponds will be fenced for public safety during the entire length of the project. During the establishment period, flows into and through the asset will be managed to suit the conditions and to protect and nurture the plants. The contractor has prepared a Construction Environment Management Plan (CEMP) to detail how it will deal with any flora and fauna issues.